Thinking about something decorative, colorful and transparent we thought of Murano glassware, to do an exercise with the primary and secondary colours. 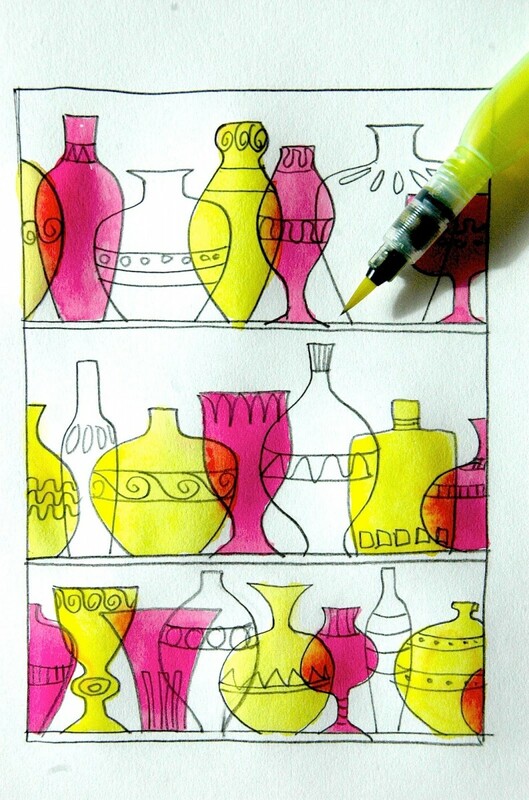 We made a drawing with pencils and permanent markers, which could imitate a shelf into a glass shop of the famous Venetian island. Then we painted the design with the three primary colours in watercolors, overlapping them in some areas, to get the secondary colours. The exercise is similar to the the previous post Colored Bulbs, just we changed the subject of the drawing! So simple and so vivid! Hi Joe! There are so many ways to explore the colour theory and work with primary colours! I'm always happy to receive your comments… Thanks a lot! What are those pens? Watercolor pens???? che idea fantastica…io per trattare colori primari e secondari stavo ancora ai noiosissimi cerchi cromatici! il disegno delle lampadine (post "colored bulbs") forse è ancora più divertente! 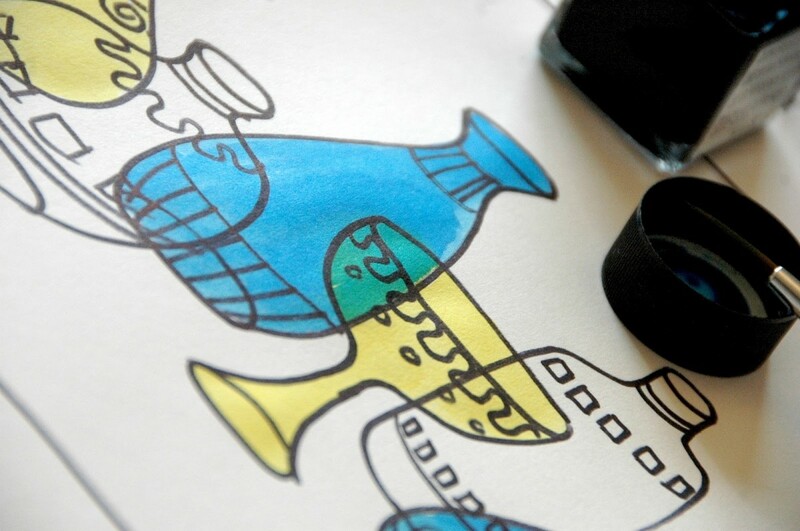 bisogna usare le Ecoline (te le ricordi che le usavamo alla scuola d'arte?) 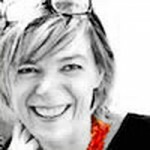 o comunque gli acquerelli… un abbraccio!!!! thanks a lot. simple, easy and beautiful!! Thanks Ko! I hope my suggestions are useful to you! I am planning to try this with my 4th graders, who are just coming off of a major figure sculpture unit and need something more pensive and calm. This fits the bill–beautiful results! 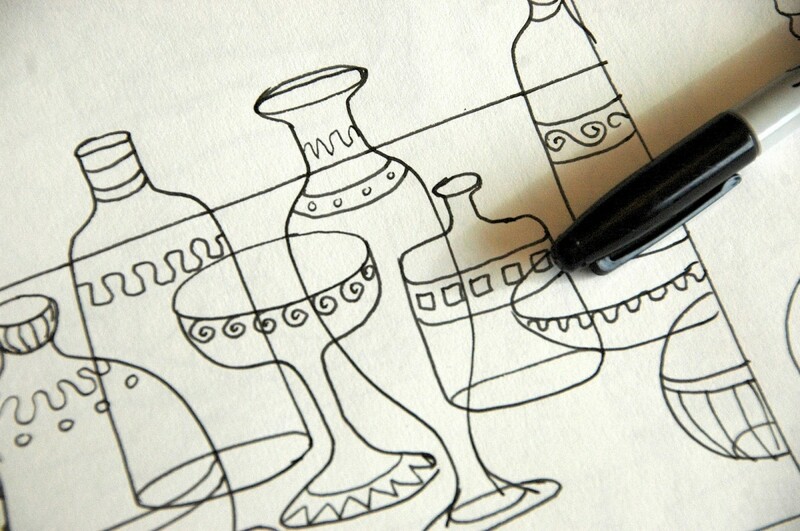 One question–did u give the students tracers for the bottles or just images to look at? 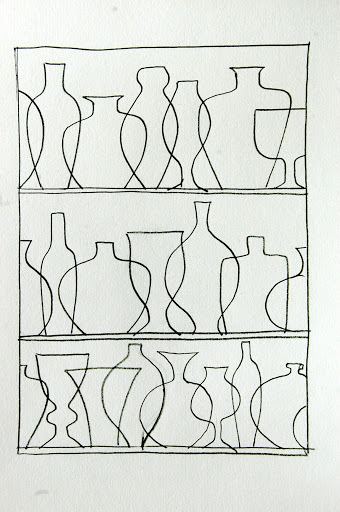 I have vases that they could use for reference as well…just wondered what you did. Thank you! Tracers are not my favorite–I will follow my gut and try to avoid them so the students are more inventive with their shapes. Thanks for the quick response–I loooove your blog! Sorry for my bad English… I mean that they overlap the bottle’s drawings in order to mix the primary colors. 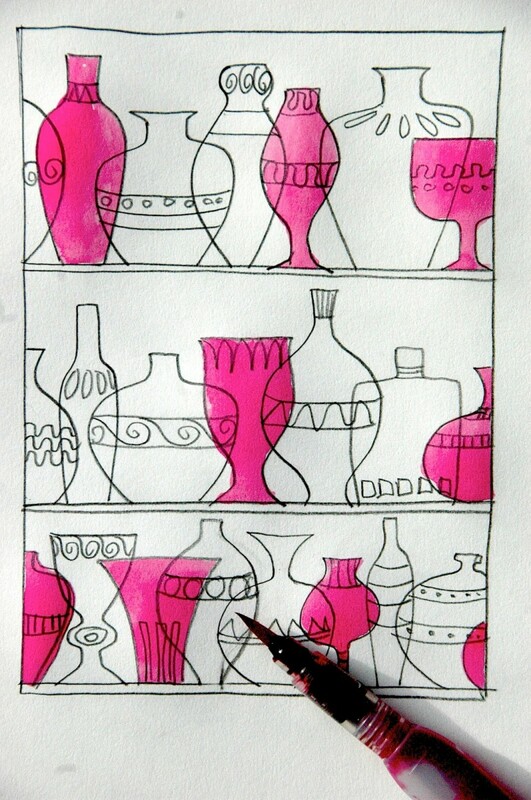 I drew the bottle on the blackboard to gave them just an inspiration, then they invented their own bottles and vases drawing free shapes handfree. Although, they didn’t traced the shapes 🙂 I’m agree with you, of course is better if students are free to invent their shapes. Sometimes I would like to say something about a method, but I can’t find the right “technical” words… I do apologize! I didn’t even notice your English! The students worked on their drawings today and they turned out great! I will post pics on my blog when they are done. Thank you so much for your help…Mille grazie! Pardon my bad Italian! 😉 I look forward to see your works! Just Beautiful and simple! 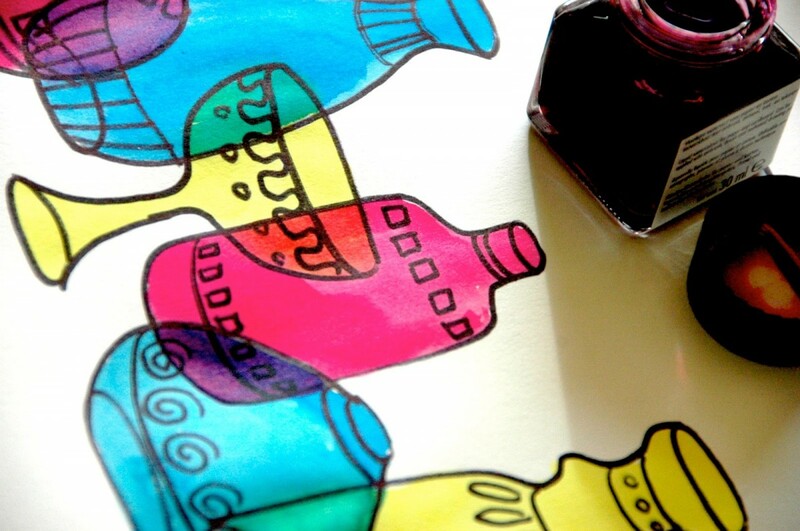 What kind of ink/water color are you using? 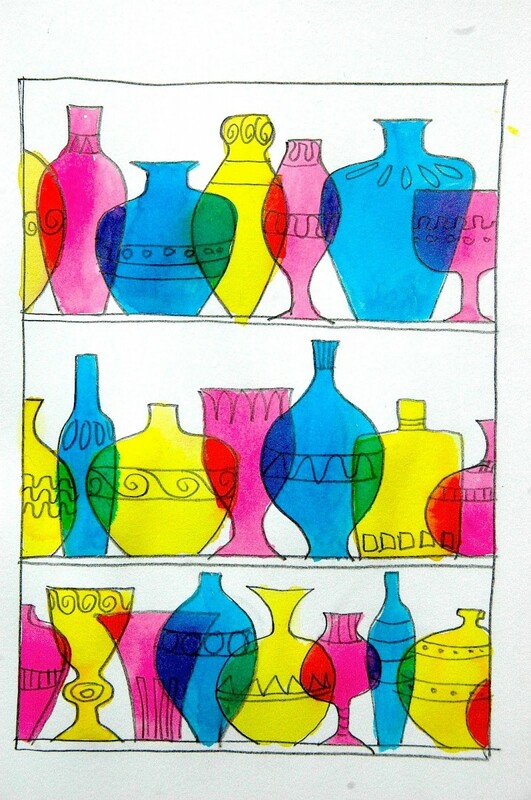 I loved the concept and idea behind these beautiful vases and bottles and did these with 3rd and 4th grades. I now see it tagged with 11 year olds and think that 4th & 5th grade may have been a better choice, third tended to be a bit sloppy on a 9×12 paper and watercolor paper is precious!! It would have also worked with white oak tag. I used the watercolor colored pencils and let them choose the 21st century primary colors -magenta, cyan, and yellow, or traditional red, blue, yellow. 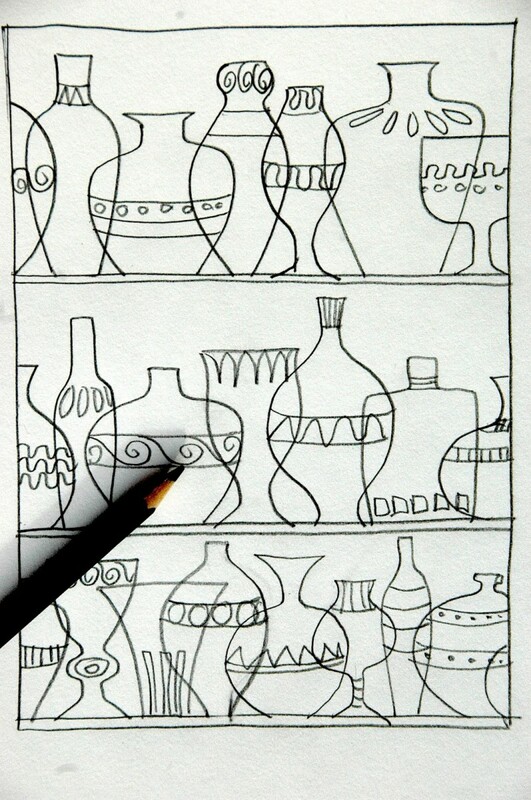 They created a symmetrical vase by folding 4×6 pieces of paper in half, drawing half a vase and cutting out then tracing. They made 3-4 vases/bottles each. Thank you for a great lesson! !